The hike to the mountain gorillas was particularly arduous that day. ‘Consistent rain made the ground very slippery,’ says Diana, ‘and the hillside was so steep it felt vertical.’ The gorilla group ahead finally settled to feed. ‘What made all the physical effort worth it was to see the mother with her two babies.’ This is only the fifth set of twins ever to be reported in Rwanda’s Volcanoes National Park. The mother was a natural with her six-month-old infants, nursing them while feeding herself. When the silverback leader of the group chased her from a nettle patch, she vocalised at him, loudly, but moved on. ‘In this picture, she is still tense from the encounter’, says Diana, ‘and continues to glance across at him while she eats. Her twins, in the comfort of their mother’s strong arms, appear blissfully ignorant.’ The twins’ future, though, remains uncertain. 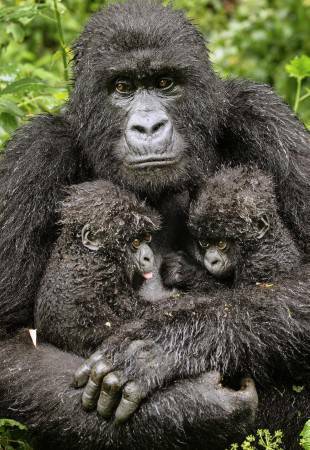 The mountain gorilla is officially listed as critically endangered. Habitat loss, poaching and disease are still threats, and the gorillas are also at risk from warring rebel factions active in their range, affecting not only the animals but also the rangers and the tourism revenue that funds their protection.